Ten Riders took part including two from Liskeard and a lost cyclist trying to find the Wadebridge U3A, unfortunately she picked the wrong day for their ride. 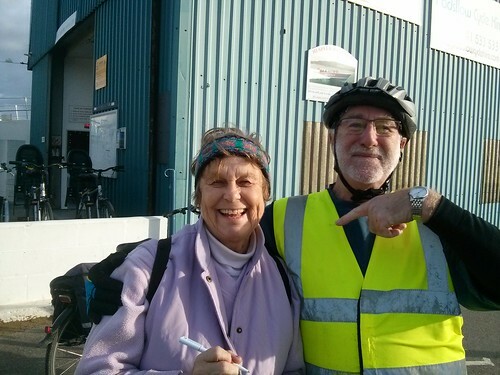 So in the spirit of the U3A we invited her to join us – what a friendly group we are. Reaching Padstow for lunch, the more affluent members of the group dined at Rick Steins Fish and Chip emporium– a full sit down job with a cup of tea. Suppose that’s one way to spend the winter fuel allowance. Others including myself enjoyed fish and chips from the common man’s chippie in the town, eating them alfresco sitting on a bench overlooking the harbour. When we all met up for the return journey we discovered that the Rick Stein diners paid no more than we did and they said “they were delicious. Must remember that for next time! So back to Bodmin and it’s a strange thing but it always seems further and harder going back. Could be the extra weight of lunch that we were all carrying . The weather was just perfect for cycling and we all had a smashing ride. I am pleased to say that Dave and Reuben are now speaking to me after last months WET ride. Don’t forget folks if Santa brings you a bike - then please join us. As this will be the last ride of the year let’s have a good turn out! We will stop in Padstow for lunch – either bring your own or buy something in one of the many shops, cafes or pubs. There is a Council Pay Car Park at Lidl’s in Wadebridge or you can park for free on the road in to Wadebridge outside the park – if you can find a space. As ever if you could let me know if you will be on the ride and if you will be starting from Bodmin or Wadebridge. If you are unsure about parking locations just let me know. 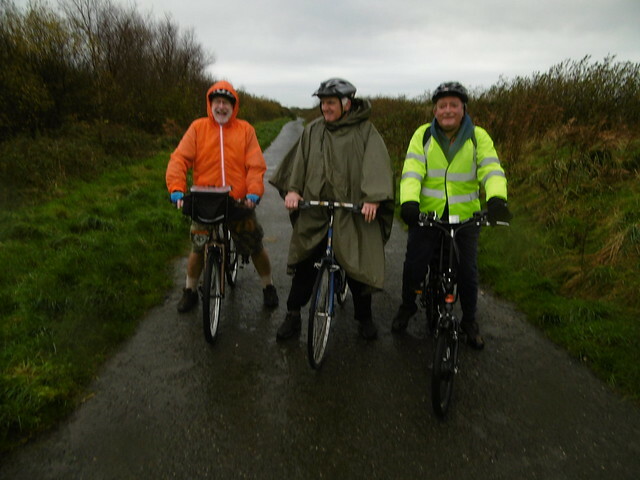 Only three members of the cycling group went on the November Ride around Goss Moor. group members who decided not to participate had some inside information regarding the weather. But being keen or should it be stupid cyclists we decided to go ahead. It wasn't good for most of the ride but when we reached our lunch stop at Gnome World the clouds came down. The gnomes all went in doors to watch TV leaving us to eat our sandwiches in the rain - still at least we didn't have to share them. I don't know if we enjoyed it because the other two are not speaking to me yet. Don't forget if you have a bike and transport then why not join us for the next ride - details to follow. Innis Downs to Goss Moor taking in the village of Belowda on the way back. 19 Miles or 8 miles if you just do the Goss Moor bit. This ride takes us from Innis Downs roundabout down the old A30 to Victoria, continuing on this road under the iron railway bridge to Goss Moor. We will cycle the trail clockwise stopping at Gnomes World for our lunch – there is no facility to buy food or drink but we do have permission to use 2 picnic tables, provided that we don’t get too familiar with the gnomes. After lunch we will complete the trail and cycle on to the village of Belowda eventually joining the old A30 and back to Innis Downs. The ride is on roads with good stretches of cycle paths and the Goss Moor trail. Mostly flat but a few inclines on the return to Innis Downs. As ever we are weather dependent. Please let me know if you will be on the ride and if you will be doing the 19 or 8 miles. This month’s ride started from St Neot Downs up from the Half Way House Inn on the Glynn Valley. Cycling towards Warleggan , across the moor to Colliford Lake. Stopping for lunch and refreshment at the Colliford Tavern. Passing grazing moorland ponies and a pair of swooping Buzzards who seemed to be taking an interest in our activity. On the return leg we stopped at the Dam Wall to appreciate the size of the lake. I can report that we didn’t have any accidents today but one rider had a puncture and I have to congratulate him on the speed at which he carried out the repair. There were 10 of us on the ride including 3 from Liskeard and a special Guest Rider from Scotland – No! not Nicola Sturgeon, his name was Alex who I am sure will be singing the praises of Lostwithiel U3A when he returns north of the border tomorrow. As ever here is a picture of the team at Colliford Tavern and this month I have included one of the bikes as proof that we do have some. If you are considering cycling then please join us – details of the October to be published later. This is not a long ride only 14 miles but the scenery is superb. The ride is on quiet roads with some hills, long but not too steep. Meet at 11am. On the A38 from Bodmin (Glynn Valley) turn left at the Half Way House. Drive up a steep hill and keep going until you reach St Neot Downs. The Car Park is on the Right just before the cattle grid. The ride is on the road to the west of the lake. We will stop for lunch at The Lake Park (Coffee and food can be purchased or take your own). We will then return the way that we came stopping to look at the lake from the Dam Wall and then back to the car park. Could you please let me know if you will be coming on the ride. Distance just over 20 miles as verified by Sue Sargent’s new trip Computer. Dunmere Road, Bodmin to rendezvous with us. on behalf of all those who took part that it was a great ride. – but there may be some tired legs tonight. A super ride on roads and the Camel Trail. After lunch it’s the Camel Trail to Scarlets Well and back through Bodmin to our cars. This is a lovely ride which is mostly flat but there are some steep hills both up and down – it’s well worth the effort. Meet at Premier Inn Car Park (we have permission to park) at 10.30 for 10.45 start - we should be at the Snail’s Pace Café by 12.30. For those who want a shorter ride of 14 miles all flat - Meet at Scarlets Well car park at Bodmin at 11 o’clock and cycle on the Camel Trail to Wenford Bridge (Snail’s Pace Café). We can then all cycle back to Bodmin together. As ever if you could let me know if you will be on the ride and if you will be doing 20 or 14 miles. 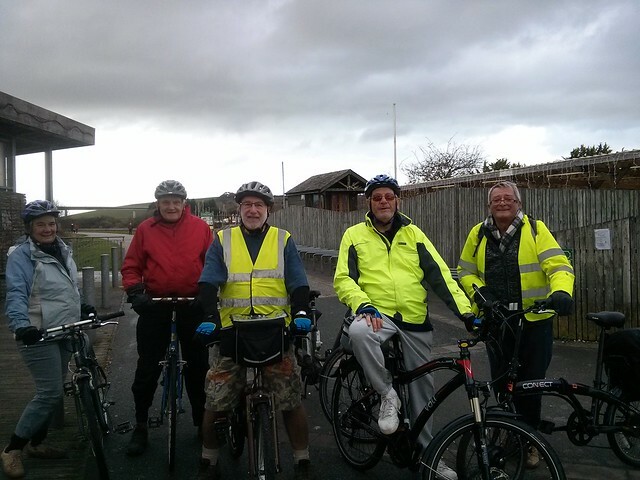 This ride was on electric assisted bikes and we teamed up with U3A members from Liskeard and Caharrick. Meeting at Pensilva and cycling on the moor lanes to Trethevy Quoit and then on to Siblyback lake which we cycled around both ways, stopping for lunch in between. Leaving Siblyback via the service road next to the dam wall and on to Golitha Falls. Then to St Cleer, passing the Holy Well which most riders were going too fast to notice. Across the moor and back to our cars. What a good ride we had! The group photograph was kindly taken by a community police officer who was on speed control duty on the moor road at the side of the car park. After he had taken the photograph he wished us to have a good ride and told us to watch our speed. We did notice that whilst he was taking the photograph he missed 3 cars possibly going a bit too fast. The ride will start from the car park at Tokenbury Corner (near the farm shop). This is predominantly an Electric Bike Ride with some riders hiring bikes from Trevalick’s Farm Shop. But non electric bikers are most welcome to join us, but there are some hills - nothing that we can’t handle. 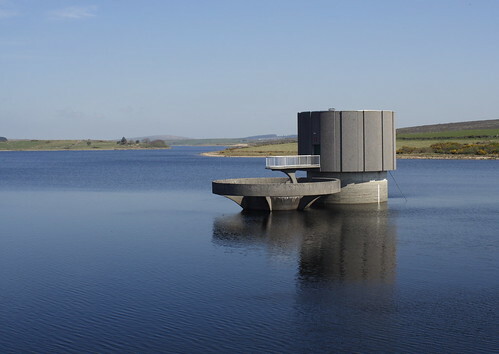 We will be stopping at Siblyback Lake for lunch – either bring your own or use the Café. After lunch we will cycle around the lake (possibly each way) and exit via the service road near the dam wall. Making our way towards Golitha Falls. From here we take the road to St Cleer and back to the car park. From Liskeard take the B2354 to Pensilva. The car park is on the left opposite the right turn to Pensilva just before the Farm Shop. The ride mostly on quiet lanes so Hi Viz tops please. Please let me know if you will be on the ride. 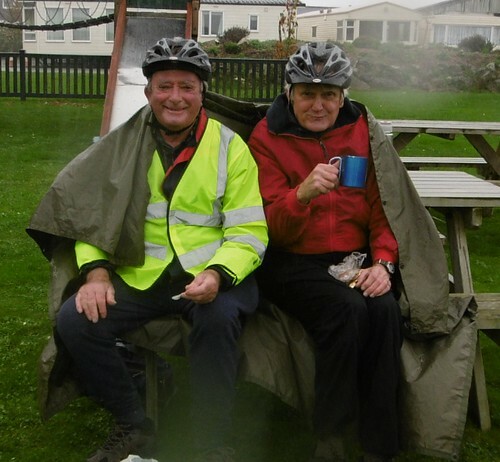 17th June the group cycled Coast to Coast from Devoran to Portreath. The weather was perfect for cycling dry and not too hot. Some riders had a slight problem finding the car park at Devoran putting the blame firmly on my dubious directions – well I knew where it was! So we got under way cycling along one of the most pleasant ways of crossing from Coast to Coast arriving at Portreath for lunch. Unfortunately the Café was closed but we did use their tables and seats to enjoy what we had brought with us. It was only as we were leaving that we discovered another Café located on the beach – so something to remember if we do the ride again. The ride back felt much easier and didn’t seem to take as long - perhaps we just wanted to get back before our legs seized up. Car Park at Devoran Take the A390 to Truro then the A39 to Playing Place and Carnon Downs. Continue on the A39 to the next roundabout. Take the first exit left to Devoran at the junction you will see a big white gate.Turn right (this road bends to the left at which point you will turn right again. Continue across a bridge and the Mining Trail Free Car Park is 100yds on the right. Car Park at Bissoe – for a slightly shorter ride. As above but when you get to the Devoran roundabout take the 3rd exit to Bissoe. Continue on this twisty road, pass under a viaduct. 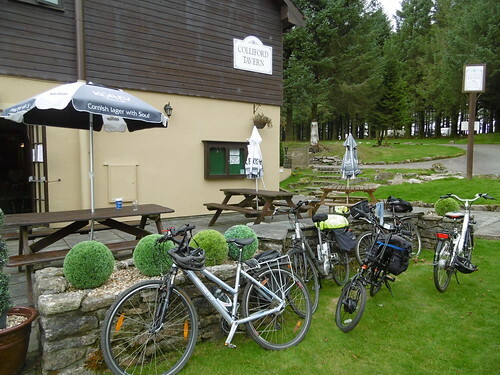 A mile further on the right you will see BISSOE BIKE HIRE and a Free Car Park. From Lostwithiel to Devoran took me just over an hour. From Lostwithiel to Bissoe allow an extra 15 minutes. Innis Downs turning left up the road to Bugle and on to Bokiddick Downs. the use of the picnic table and for the company of the farm dog. that I had taken a first aid kit with me. have some enjoyable rides and they are not too strenuous. At last we got a lovely day for it and nine riders. Stopping at Padstow for lunch and boy how the prices have gone up £4.20 for a not so large pasty and Reuben said that he had to take out a mortgage for his Fish and Chips. But they were nice! We had a lovely ride enjoyed by all even the two who managed to fall off their bikes – we have all done it at some time! We could do with some new members in the cycling group – so if you have a bike and means of transport - please join us. You don’t have to be a super fit cyclist to enjoy our rides and the wearing of lycra is not compulsory. April bike ride on Wednesday 15th. CAMEL TRAIL and the weather looks like it should be ok. If you are cycling Bodmin to Wadebridge or Bodmin to Padstow meet at 10.45 Borough Arms Car Park. If you are cycling Wadebridge to Padstow meet at 11.45 Lidles, Wadebridge at the start of the trail. Hope that we get a good turn out and if you know anyone else who may like to come along please bring them with you. Could you please let me know if you will be on the ride and which bit you are doing. We had the best weather of the year so far – unfortunately we only had three riders. So on the most beautiful of sunny days we cycled from St Austell along Porthpean Road to Pentewan and boy is that hill steep dropping down to the village. It was brakes on all the way. We sat in the square, had a coffee from the little Café and a bit of silly banter. It was then through the gate and down the track towards the beach for a look at the sea. Returning toSt. Austel via the Pentewan Trail. What a super outing. Next Months Ride will be on Wednesday the 15th April along the Camel Trail – details to follow. St Austell to Pentewan – Approx 10 Miles. 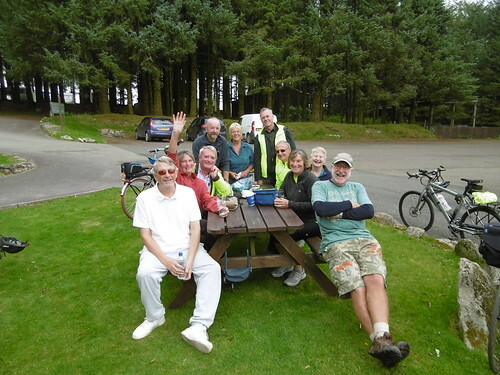 We will cycle to Pentewan via Porthpean Road returning to St Austell along the Pentewan Trail to B & Q then up the road and turn left at the Asda roundabout back to the car park. A view across Pentewan harbour, which was connected to St Austell by the Pentewan railway. China clay and tin were exported from here and coal was imported. The harbour fell into disuse when the entrance passage silted up in 1916. This is an easy ride on roads and trail with a small hill from St Austell up to Porthpean Road and from the Mevagissey Roundabout back to the car park. Hi viz jackets would be good. The ride should take no more than 90 minutes so we should be home for lunch. As ever please let me know if you will be on the ride so we know if we have to wait for anyone. Boconnoc making our way to St. Nectans Church which is always worth a visit. Then on to the Lerryn Road and back to Lostwithiel via Newham and Polmena. A great ride enjoyed by all. future ride. Usually the third Wednesday of each month. Meet in Lostwithiel Main Car Park 11 am or on the A390 at the junction with Grenville Road at 11.10. From here we will cycle on the pavement up to St. Winnow School which is a bit of a hill but nothing that we can’t manage. Then ¾ of a mile on the main road turning left just past the MOT garage. On the road towards Respryn and turn right on to some quiet flat roads to Trewithen Dairies and a bit further. Back the way we came but turn off the A390 and on to St Nectan’s Church where we will have a stop– there is one seat outside and two benches in the Church Porch. From here we join the Lostwithiel - Lerryn road and cycle up to Newham to admire the view across the valley then it’s all down hill to Lostwithiel. This is an all road ride but apart from the 2 short stretches on the A390 they are quiet roads. High vis jackets would be good. There are a couple of not too steep hills but for a Lostwithiel ride this is amazingly flat. Hope that you can make it but as ever please let me know either way. St Austell to Pentewan – Approx 10 Miles - Meet at 11 am. Please, Please, Please lets' have a dry Day !! Park in the Free Car Park outside the Capital Bingo Hall, Alexandra Road, St Austell. B & Q then up the road and turn left at the Asda roundabout back to the car park. This is an easy ride on roads and trail with a small hill from St Austell up to Porthpean Road and from the Mevagissey Roundabout back to the car park. Hi viz jackets would be good.